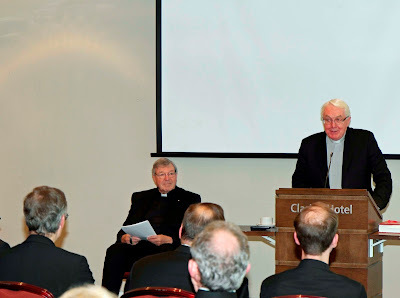 The fifth session of the Fota International Liturgy Conference took place on Monday morning, 6 July 2015, chaired by His Eminence George Cardinal Pell and moderated by Professor Manfred Hauke. Two papers were presented, one by His Eminence Raymond Leo Cardinal Burke, the other by Fr. Sven Conrad, FSSP. H.E. 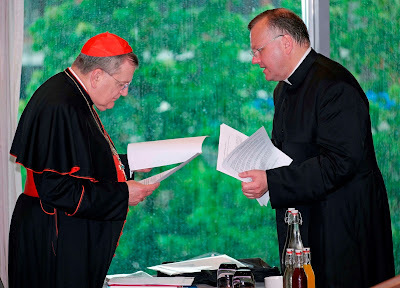 Raymond Cardinal Burke and Fr Sven Conrad F.S.S.P. 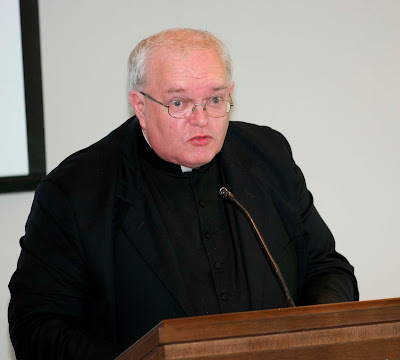 Cardinal Burke’s submission, entitled Selected Canonical Questions regarding the Royal Priesthood of the Baptized, described how canonical discipline offers nothing original to the question of the royal priesthood of the baptised but rather safeguards and fosters the theological reality. The canonical discipline serves, in a particular way, the equal dignity of all the baptised and the distinction of two states of life: the lay state, the consecrated state and the clerical state. The distinction between the lay state and the clerical state belongs to the divinely established hierarchical structure of the Church. The consecrated state does not belong to the hierarchical structure of the Church but to the holiness of the Church. The lay faithful, under the care and direction of the Bishops and Priests, carry out the apostolate for the sanctification of the temporal order. The lay faithful can operate in the exercise of the clerical office but they cannot substitute for it. Such collaboration must carefully avoid any confusion about the irreplaceable service of the ordained. The liturgical expression of the priesthood of the baptised is acturna participatio, the union of heart with the glorious pierced heart of Jesus. In the post-conciliar implementation, a certain confusion of the lay and clerical states has entered into the life of the Church to the serious harm of Church life. He then summarized the history of the minor orders, which are all mentioned in a letter of Pope Cornelius as early the year 251. The paper then considered the changes made by Pope Paul VI. and with the questions arising from those changes. In developing some basic points of the theology of minor orders, the paper referred both to the classical meaning of sacramentals and the definition of sacramentals as found in Sacrosanctum Concilium (no. 60). They are sacramentals which ‘in aliquam Sacramentorum imitationem’ refer to the sacrament of the priesthood and not to baptism. Being sacramentals, the minor orders are expressions of the Church’s intention in certain matters (e.g. the struggle against evil). Therefore the existence of the minor orders or their non-existence is linked with the cultic power of the Church in general. Reducing the minor orders weakens the Church’s own cult-power. The sixth session of the Conference, held in the afternoon, was chaired by His Eminence Raymond Leo Cardinal Burke and moderated by Professor Rodney Lokaj. It commenced with a paper by Professor Manfred Hauke which was followed by submissions from His Eminence George Cardinal Pell and Fr. João-Paolo Mendonça Dantas. In his paper, entitled The “Sensus Fidei” of the Laity according to John Henry Newman and Contemporary Theology, Professor Hauke noted that during the preparation of the Extraordinary Bishops’ Synod on the family, some voices referred to the majority opinions of the faithful in certain countries as having the ability to ‘develop’ or to change the doctrine of the Church. But he posed the question: do such statements express the ‘sense of the faith’ (sensus fidei) referred to by the Second Vatican Council? The conference deals with the essay of Blessed John Henry Newman ‘On Consulting the Faithful in Matters of Doctrine’, which was published in 1859. The appeal to the sense of the faithful appeared in a specific historical context, encouraged by the preparation for the dogma of the Immaculate Conception, in which Pope Pius IX made reference to the testimony of the Christian people. Newman describes the basic elements of the ‘sensus fidei.’ Using the example of the fourth century struggle against the Arian heresy, he observes that the majority of the bishops and many Episcopal synods failed to preserve the Faith, whereas the testimony of the Christian laity, guided by holy bishops, such as St. Athanasius, remained faithful to its Baptismal vows. George Cardinal Pell then delivered his paper The Vine and the Altar: Learning from the Teaching of St. John Paul II on the Priestly role of the Catholic Laity. 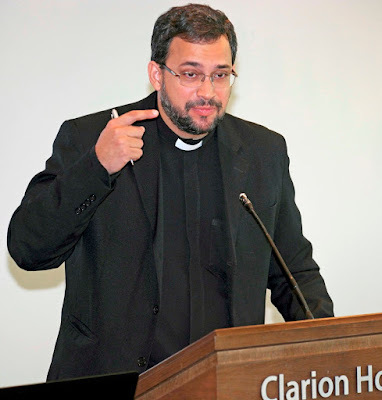 The final paper of the Conference was delivered by Fr. João-Paolo Mendonça Dantas. Entitled The New Movements in the Service of the Unity of the Church. Reflections on the Charismas of Laity in the Light of the Thought of Joseph Ratzinger, the submission noted that during Vespers of the Solemnity of Pentecost 2006, in the context of a festive meeting with the New Movements in St. Peter's Square, Pope Benedict XVI addressed a homily to all present that summarized the mission of the Holy Spirit in the Church and in the world through presentation of three of His gifts: life, freedom and unity. Before concluding his homily, the Pope exhorted the members of all Movements: «Dear friends, I ask you to collaborate even more, very much more, in the Pope's universal apostolic ministry, opening doors to Christ». In this homily, the Pope seems to suggest that there is a theological relationship between the ministry of the Successor of Peter and the apostolic activity of the New Movements. This papal statement, Fr Dantas pointed out, echoes a theological idea expressed in a masterly way by Cardinal Joseph Ratzinger, in a paper entitled The ecclesial Movements: A Theological Reflection on Their Place in the Church, delivered during the opening of the World Congress of Ecclesial Movements organized in Rome in 1998 by the Pontifical Council for the Laity. Fr. 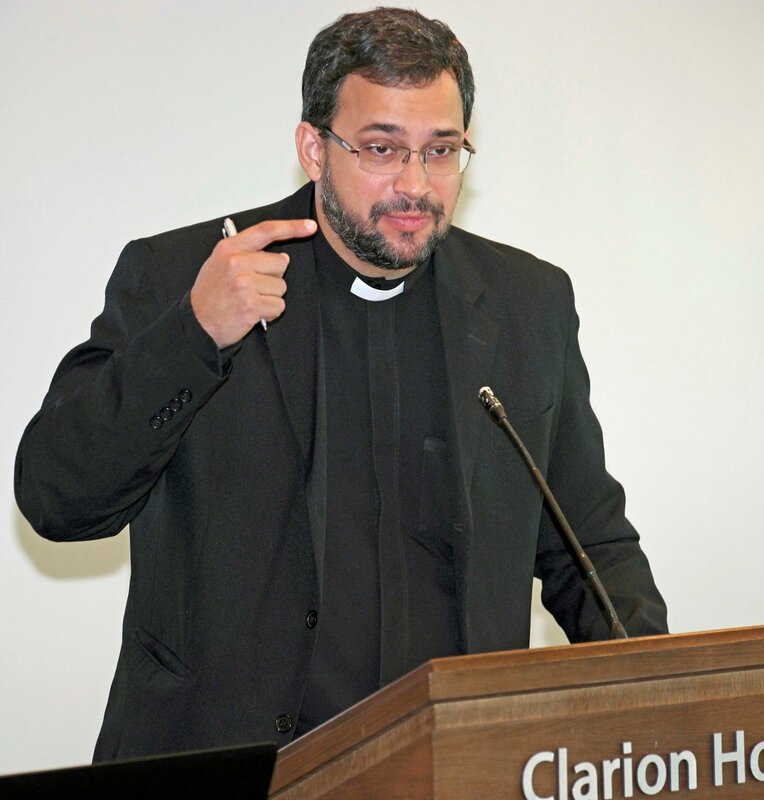 Dantas sought to present and, analyze Cardinal Ratzinger’s paper from which emerges a beautiful and interesting reflection on the relationship between the New Ecclesial Movements and the ministry of the Successor of Peter, a relationship that, according to the German author, expands, in a sense, the traditional notion of Apostolic Succession. A lively discussion followed. In its annual report, St. Colman’s Society for Catholic Liturgy announced that the proceedings of the sixth Fota International Liturgy Conference (held in 2013), edited by Fr. John M. Cunningham, OP, Professor of Christology at the Angelicum University (Rome) and Prior of San Clemente, were about to be sent to the printers. It was expected that the volume, Sacrosanctum Concilium 1963-2013: Liturgy and the Second Vatican Council, would be released early in September 2015. The release of Fota VI would bring the publication of the Conference’s acta up to date and finally eliminated a time-lapse connected with the publication of the proceedings of the Fota I acta in 2010. It is planned that the editing process of this year’s proceedings will be completed by the end of January 2016 and the resulting volume released at Easter 2016. The Society was very happy to announce that the acta of Fota I, Benedict XVI and the Sacred Liturgy, had been translated into German by Emilia and Dr. Peter H. Gorg. The translation was edited by Professor Manfred Hauke and published by Pustet in Regensburg. The German edition of the book carries a foreword by Kurt Cardinal Koch and a review by Raymond Leo Cardinal Burke. Copies may be obtained directly from Pustet or through the Society. The Society also announced that it had launched a pamphlet series to promote liturgical and theological subjects among a wider general audience. The object of the initiative was to make good material easily accessible both in terms of readership pitch and cost. 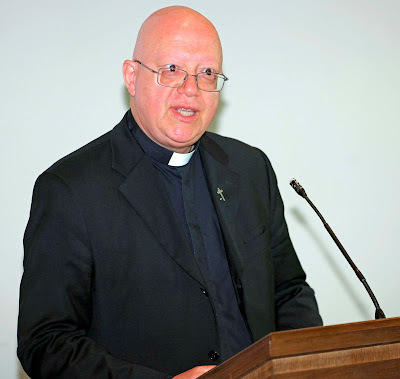 The Society concluded its annual report by thanking its generous benefactors who underwrite the expenses of the Fota International Liturgy Conference – especially Dr. Carl Anderson and the Knights of Columbus, New Haven, Connecticut, P. Stephan Horn and the Ratzinger/Benedikt XVI Stiftung, Munich, several members of the clergy and laity in the diocese of Cloyne as well as private benefactors in Ireland, the United States and Germany. A special vote of thanks was extended to Dr. Patrick McCarthy, PP, St. Peter and Paul’s parish, who very kindly made his beautiful church available for the liturgical ceremonies attendant on the Conference and to all who assisted in any way. The proceedings of the Fota VIII International Liturgy Conference were closed by His Eminence Raymond Leo Cardinal Burke.